There's never a dull moment where comets are concerned! In the thick of all the excitement and speculation over ISON comes the news that a run-of-the-mill comet, 2012 X1 (LINEAR), has undergone an outburst that has caused a 100-fold increase in its brightness, catapulting it from a predicted 14th magnitude to magnitude +8.5, within range of large binoculars and small telescopes. All this whilst 2012 X1 is still 443 million kilometers (275 million miles) from Earth and four months away from perihelion (closest to the Sun). 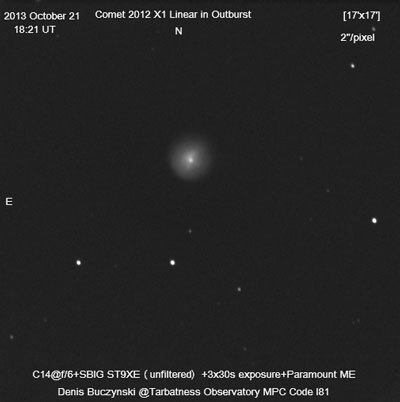 Following reports on Central Bureau Electronic Telegram (CBET) 3674 that H Sato of Tokyo had measured the comet's magnitude at +8.5, veteran UK amateur astronomer and secretary of the British Astronomical Association's (BAA) Comet Section, Denis Buczynski, imaged 2012 X1 on 21 October from his observatory in Aberdeenshire, Scotland. "I imaged the comet this evening at 18:21 UT on the south-west horizon just before moonrise," he says. "The comet is in outburst and my image shows a circular disc-like form about two arcminutes in diameter with a curved jet-like structure at its centre. It has the appearance of a mini 17P Holmes [a comet that outburst in 2007]. How this outburst will develop over the next few weeks will be very interesting." Denis and Richard Miles, another long-standing BAA observer, have processed Denis' image and examined the comet's coma. Richard likens this outburst to the outburst of comet 29P Schwassmann-Wachmann in February 2010, when it reached tenth magnitude. Richard Miles has compared 2012 Xi's outburst with that of comet 29P Schwassmann-Wachmann in February 2010. Image: Richard Miles. Larger image. The well-known and prolific comet observing and imaging team of Ernesto Guido, Nick Howes and Martino Nicolini remotely imaged the comet from New Mexico, USA, also on 21 October. Guido et al report that 2012 X1 has a 105-arcsecond coma with a sharp central condensation around 15 arcseconds in size. 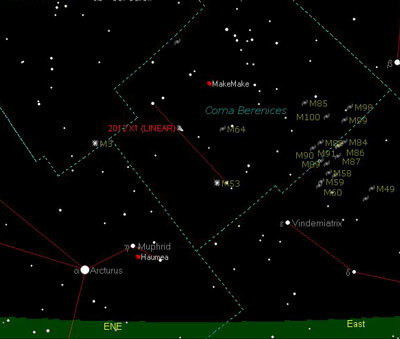 Romanian amateur astronomer Maximilian Teodorescu observed the comet on 22 October and confirmed its brightness and appearance. "It looked exactly like Comet Holmes back in 2007. I could not see the comet through the eyepiece of my 4.5-inch refracting telescope, but the camera detected it easily enough," he says. Amateur observers worldwide fondly remember the incredible outburst of 17P/Holmes, six years ago to the month, when it brightened from a lowly 17th magnitude to a brilliant naked-eye magnitude of +2.8 within two days and its coma expanded from three to thirteen arcminutes. An estimated one percent of Holmes' mass was ejected. Whilst 2012 X1's outburst is not in the same league, it's still an exciting event for astronomers to monitor over the forthcoming nights. 2012 X1 (LINEAR) currently lies in north-eastern Coma Berenices, moving eastwards towards the border with Booetes at a steady rate of 1.5 arcseconds per minute or 1.5 arcminutes per hour. This makes it a morning object visible in the pre-dawn sky, although at the moment it can see seen very low down in the evening sky in troublesome twilight from the UK. Its elongation from the Sun is 37 degrees and increasing. You will have to rise early from that warm bed to catch the comet. Here is the view from London on 24 October at 6am, with the 2012 X1 (LINEAR) 20 degrees up and visible in large binoculars and small telescopes. Graphic made using the Sky version 5 (www.bisque.com) . From London the comet rises at 3:40am BST and by 6am, around 90 minutes before sunrise, it has risen to 20 degrees above the east-north-east horizon in a still dark sky (with the Sun still 16 degrees down). It will climb a couple of degrees higher before the twilight interferes 30 minutes later. In Edinburgh 2012 X1 rises at around 3:20am and 90 minutes before sunrise at around 6:30am the comet is nearly 22 degrees up in a still usefully dark sky (with the Sun 12 degrees below the horizon). The further north you observe from the better. From Montreal, Canada, 2012 X1 rises at 4am and an hour before sunrise at 6:20am it can be found 20 degrees above the eastern horizon. Slightly further south in New York and Chicago the comet is also 20 degrees up at around the same time, locally an hour before sunrise. Heading south to Houston and Miami the comet will only get 10-12 degrees up an hour before local sunrise. In Los Angeles the comet will be a reasonable 15 degrees above the eastern horizon at 6am, an hour before sunrise. Unfortunately the comet is not visible at the moment and observers will have to wait to close to perihelion next February for it to emerge into the morning sky. 2012 X1 (LINEAR) continues its eastern motion, moving from Coma Berenices into Boötes on 2 November and it passes within a degree north of brilliant orange Arcturus (alpha Boo) on 17 November. At this time the comet's elongation from the Sun has increased to 43 degrees, making it easier to observe in the pre-dawn hours; by 5am GMT, one hour before sunrise, 2012 X1 will be 25 degrees up. Further observations in the near future should make the comet's status clearer; it could have broken-up but this is not certain. Please send any images and observing report to Astronomy Now magazine and the BAA and Society for Popular Astronomy's comet sections.